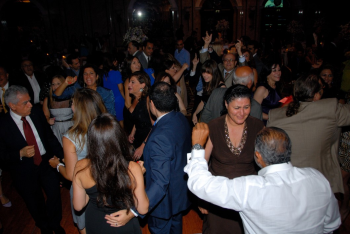 On Wednesday July 11, 2012, the Alumni Relations Office organized its annual dinner at Phoenicia Hotel with around 350 alumni and friends in attendance. The Alumni Relations Office presented two alumni awards, the Alumni Recognition Award & the Alumni Achievement Award. The Alumni Recognition Awardwas granted to an exceptional alumni figure Mrs. Lamis Alami ‘64, who dedicated her whole life to educated people especially Palestinian Refugee women and also worked at many NGO and Human Rights organizations. She is currently the miniater of Education and Higher Education in the Palestinian Authority. The Alumni Achievement Award was granted to yet another exceptional alumni figure Mr. Ahmad Farroukh ‘83 and ‘90, Group Cief Operating (GCOE) and Vice President (VP) of West and Central Africa WECA region, MTN Group Limited. Mr. Farroukh is also the founter and owner of Starbow, a regional airline focusing on the West Africa market.